For the similarly named region of Antarctica, see Ross Dependency. An aerial photograph of Ross, with the Tasman Sea seen to the right. 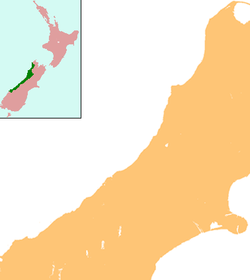 Wikimedia Commons has media related to Ross, New Zealand. Ross is a small town located in the Westland District on the West Coast of New Zealand's South Island. Lying 27 kilometres south-west of Hokitika and 46 kilometres north-east of Harihari, State Highway 6 passes through Ross on its route from Ruatapu south to Pukekura, Harihari, and further south, the Franz Josef Glacier. Ross was established in the 1860s, during the West Coast Gold Rush, where it became an important centre for miners. At its largest, the town had around 2,500 inhabitants, but the population declined after local goldfields were depleted in the early 1870s. Quartz was occasionally mined on Mount Greenland, a nearby ridge, but little more gold was found until two miners discovered a large 3.1-kilogram nugget in 1909, which was later named the "Honourable Roddy Nugget", after Roderick McKenzie, the Minister for Mines at the time. A branch line railway known as the Ross Branch was extended from Ruatapu to Ross on 1 April 1909, serving as the southern terminus of the line owned by the New Zealand Railways Department. However, a lengthy privately owned bush tramway ran south from the railway station to serve logging interests near Lake Ianthe and a railway extension from Ross through the Haast Pass to connect with the Otago Central Railway was proposed in the early 20th century, but did not eventuate. From the 1940s until 9 October 1962, a Vulcan railcar service operated directly from Christchurch to Ross twice a day. A lack of traffic and expensive maintenance costs meant the line was closed beyond Hokitika on 24 November 1980. Much of the old track bed between Ruatapu and Hokitika can be driven as it serves as an access road for local farmers, and a disused truss bridge still stands north of Ross. The population, recorded as 297 people in the 2013 New Zealand census, is largely European in ethnicity, with a minority claiming Māori descent. The town's economy is based around farming and forestry, although a large open-cut mine has operated directly adjacent to the town since 1988. Ross School, a coeducational contributing primary school with a decile rating of six and a roll of 24, is located within the town. ^ Roger Smith, GeographX (2005). The Geographic Atlas of New Zealand. Robbie Burton. map 165. ISBN 1-877333-20-4. ^ Heritage Archived 5 February 2013 at the Wayback Machine – Ross Goldfields. Retrieved 18 June 2012. ^ Visitor information Archived 5 February 2013 at the Wayback Machine – Ross Goldfields. Retrieved 18 June 2012. ^ Ross, The West Coast, South Island, New Zealand – Visit New Zealand. Retrieved 18 June 2012. ^ Churchman & Hurst 2001, p. 193. ^ David Leitch and Brian Scott, Exploring New Zealand's Ghost Railways, revised edition (Wellington: Grantham House, 1998 ), 60-1. ^ "Ross, West Coast". Te Ara: The Encyclopedia of New Zealand.